Play Bocce, Mini-Golf, Jenga, and Soccer Darts with friends to win great prizes and support the athletes! 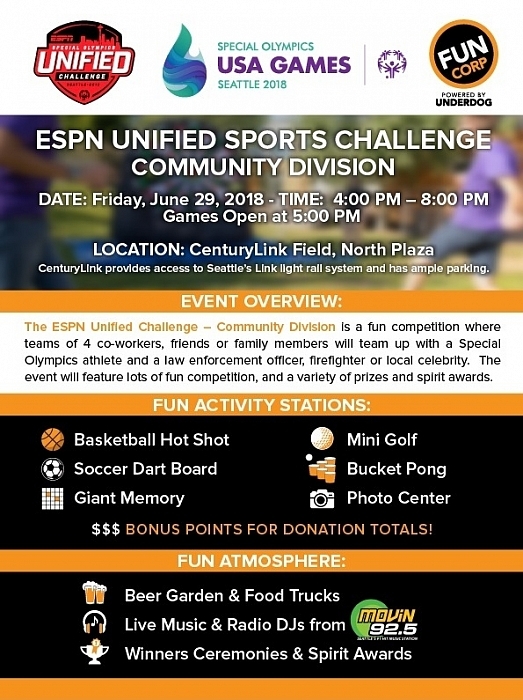 The ESPN | Special Olympics Unified Sports Challenge – Community Division is a chance to test your skills in fun games like bocce, mini-golf, and Giant Jenga, and benefit Special Olympics athletes competing at the 2018 Special Olympics USA Games. Grab your friends or family members to register a group of 4. Your team will join together with a Special Olympics athlete and a law enforcement officer or fire department personnel to create a “unified” team of six people. Teams can play at their own pace through six activity stations, scoring points with top teams advancing to the playoffs. Top teams can win prizes, including a $500 Gift card with Underdog Sports Leagues, and all teams can compete for the Spirit Prize, another $500 gift card, for teams showing the most spirit, sportsmanship and themed costumes! There will be a beer garden, food trucks and live music on site, and local celebrities to cheer you on. Most importantly, this event raises money for the athletes competing at the 2018 USA Games. Your team signup and donations will make the Games a life-changing experience for the athletes competing this summer, and the top 2 fundraising teams will get an automatic berth in the playoffs as part of the scoring. Start reaching out to your social circle to raise money to support the 2018 Special Olympics USA Games, and get a head start on the Challenge! Click here or on the "Learn More" button below for more details!